Wow, to say I learned a lot at the 2018 Clermont CAMTRI Sprint Triathlon American Cup would be an understatement. 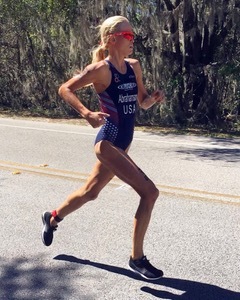 Going into the race, I felt a little anxious because it would only be my second professional ITU race (and a shot at redemption after crashing on my bike at my first professional race in Barbados just two weeks prior). I tried my best to shake off the pre-race nerves and take each leg of the triathlon one at a time. When I finally finished the 750m swim, I immediately felt relief because I knew the hardest part of the race was over. I could sense that I didn’t swim very well, but I came out of the water with a couple of other strong girls to work with on the bike, which gave me a little burst of motivation. We were around 45-60 seconds down from the front bike back after the first of the four 5k bike loops. Although my small bike group worked well together, our effort wasn’t enough to make up any ground. We lost another 45-60 seconds off the large front pack over the course of the bike leg, leaving me with 90+ seconds to make up on the run. While I’m a strong runner, I didn’t know if I had quite enough speed to make up that large of a deficit. Nonetheless, I was going to try my hardest to pick off as many girls as I could. Thankfully, I came off of the bike with peppy legs. In my Barbados race two weeks earlier, my legs felt pretty heavy on the run after pulling along two other girls for the entire 20k bike. Having a couple of other girls to work with on the bike this time paid huge dividends for me on the run. I took the first loop of the 5k run course hard but comfortable – I didn’t want to go out too hot and fade at the end, so I chose a pace that felt sustainably difficult. By the end of the first 2.5k, I ran myself into 8th place after coming off the bike in around 15th place. I knew I could still catch more girls, so I continued to charge forward (even when my legs started to feel like bricks with around 800m to go). By the end, I passed another 4 girls to finish in 4th place in my second professional ITU race. I crossed the finish line happy because I knew I had run well, but also a bit dissatisfied with how I had started the race. I’ve gotten to the point in my short, 9-month triathlon journey where I know I’m fit, but fitness isn’t enough. I need more time and experience under my belt to make the jump to the next level. Although I wish Clermont had gone better for me, I know wishing won’t get me anywhere. It’s time to get back to the grind and work towards building the strength and skills I need to become a top level ITU triathlete. Thank you so much to @usatriathlon, @TeamPsycho, my coach Jarrod Evans, and my friends and family for their continued support in my triathlon pursuit. My next two races will be the Escape Surf City Triathlon on April 21st and the Richmond Continental Cup on May 6th – I can’t wait to get after it!